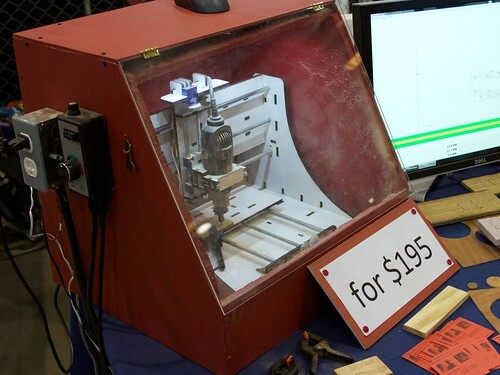 Part of our continuing coverage of highlights from the 2014 Bay Area Maker Faire. 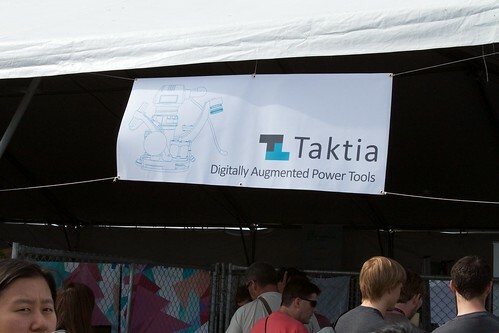 One of the most exciting new technologies that we saw at Maker Faire was from Taktia, a startup making augmented-reality power tools. They were showing off their semi-automated handheld wood router. 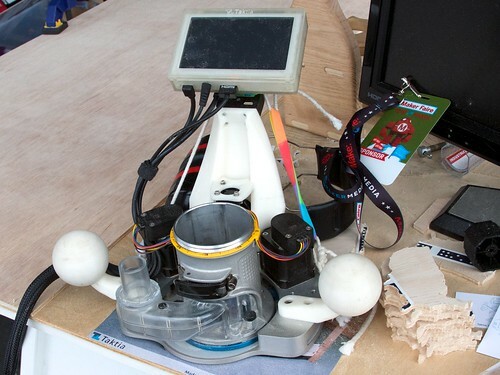 The router sits in a robotic cradle with a computer vision system and a screen. 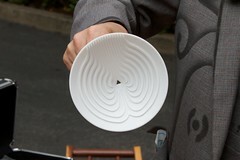 The human guides the router by hand, keeping its center within a 1 inch diameter circle shown on the LCD screen. As the human moves the router, the cradle makes fine corrections to put the router bit exactly where it needs to be, allowing a non-expert to cut precise, complex shapes, while only moving the router along a coarse path. 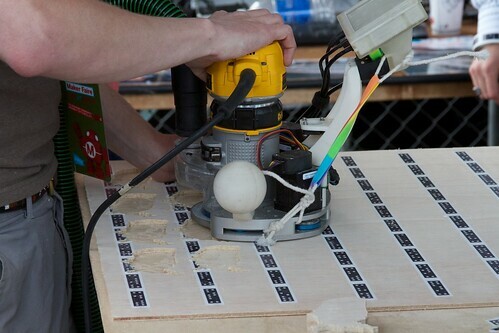 In the photo above you can see some wooden shapes that visitors were cutting out, by only moving the router freehand, while letting the robotic cradle do the hard work. We can certainly imagine other tools getting the same “robotic upgrade” — this startup will be worth watching. This entry was posted in CNC, Engineering, Robotics and tagged makerfaire. Bookmark the Permalink. Mike from hackaday caught up with me at Maker Faire and got a bit of video of my racing snail, which I was showing as an example of soft circuitry alongside various projects of our friend Meredith, including her awesome StarBoard flexible circuit LEDs. 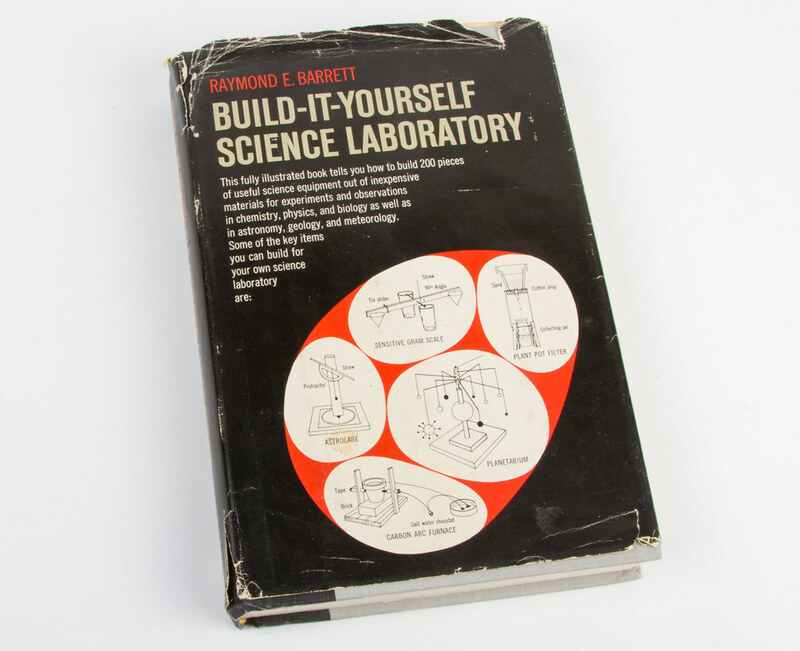 Mike’s writeup points to the history and variety of Bristlebot projects. The racing snail is a personal favorite, with the nap of the fabric foot providing the direction to the bot’s motion. 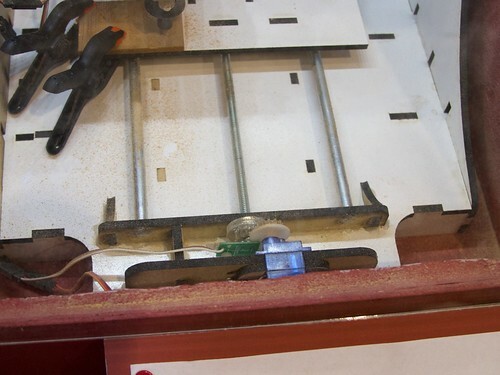 This entry was posted in Engineering, Field Trips and tagged makerfaire, snails. Bookmark the Permalink. 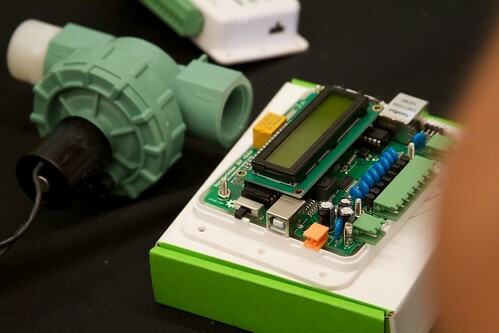 We can’t say how many times we’ve heard people ask questions about hacking or building their own sprinkler controllers, but apparently here are the ones that everyone has been looking for. 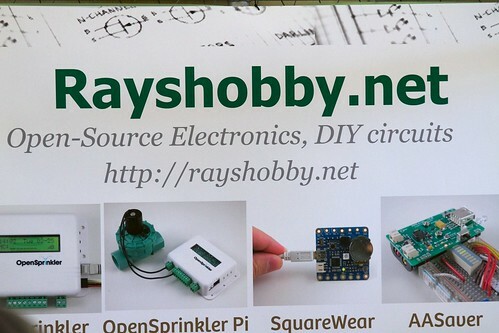 These open source hardware sprinkler controllers from Ray’s Hobby — designed so that you can hack and build your own — look well-made and genuinely useful. 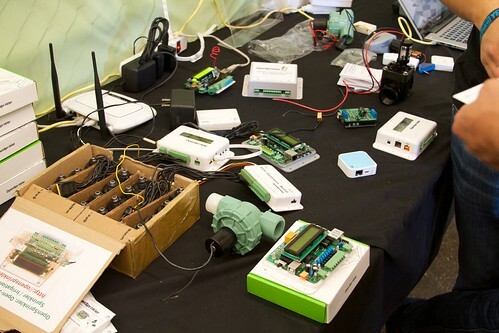 There are neat irrigation (and multipurpose relay) controls, including Arduino-flavored variants as well as versions for Raspberry Pi and BeagleBone lovers. This entry was posted in Electronics, Engineering, Open Hardware, Robotics and tagged makerfaire. Bookmark the Permalink. Not that I’m normally one to get excited about electronic breadboards, but I’ve had to change my mind after seeing these at Maker Faire. 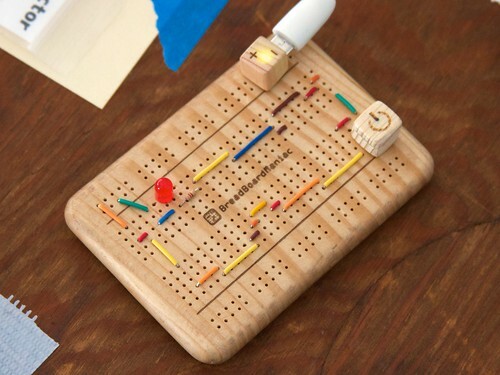 These breadboards by BreadBoardManiac are some of the finest electronics accessories that I’ve ever seen. 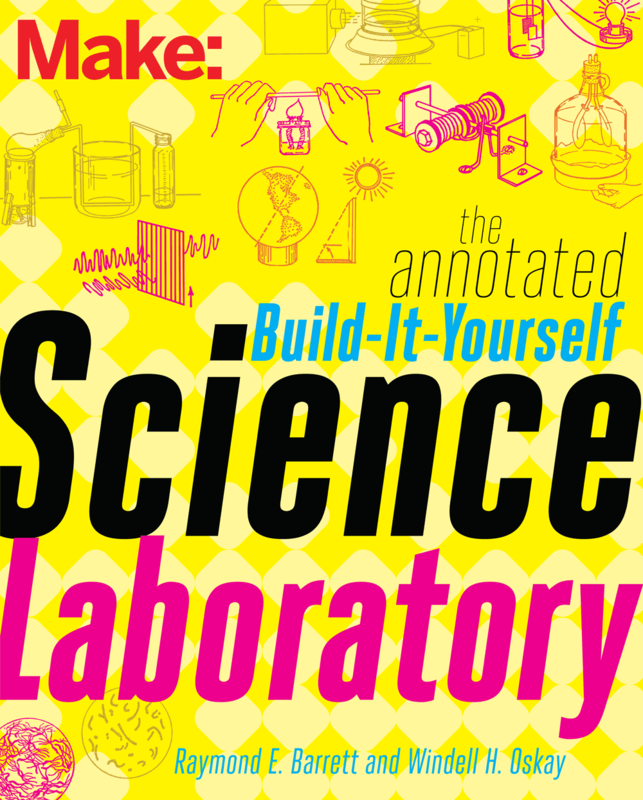 Not only do they snap to Lego bricks (making one heck of a cool building set), but they are also super-thin and double-sided, so that you can insert components from both sides. They suggest that you can use that feature to make multi-layer breadboards with vertical interconnects, but perhaps that is a bit of a stretch. Their handmade limited edition wooden breadboards are perhaps even cooler, and were made available as part of this kickstarter project earlier in the year. This is what I’d expect kids in school to learn electronics with, and it sure would be nice if a production version became available in the future. 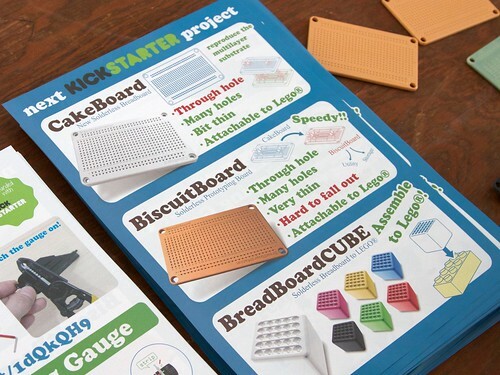 It looks like there’s also a flexible breadboard under development, amongst other types. I can hardly wait to get my hands on all of these. 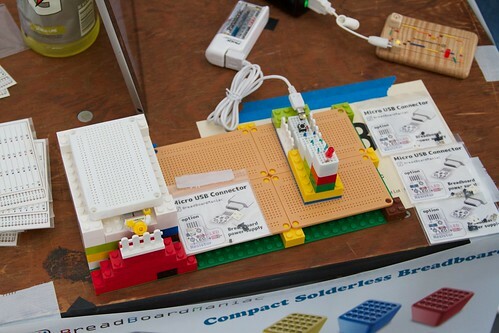 This entry was posted in Education, Electronics, Engineering and tagged breadboard, lego, makerfaire. Bookmark the Permalink. The Zero Gravity Cocktail Project is an attempt to bridge the gap between the space tourism vision and mainstream reality. 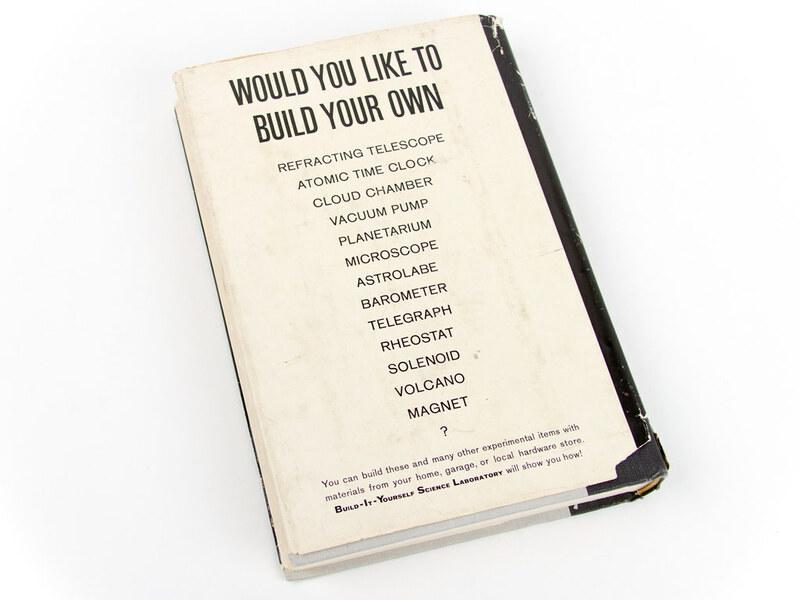 By creating a fun object that appeals to many people, we hope to show that space tourism is not an abstract concept but a stepping stone for improving the way people live, work, and play beyond planet Earth. 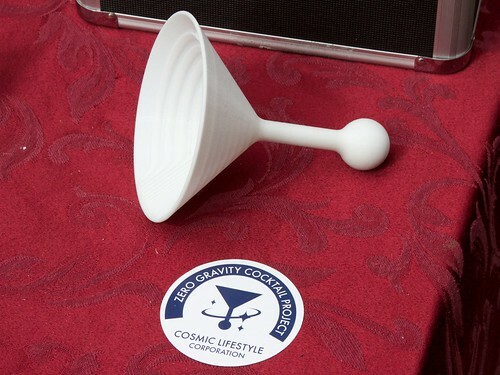 Fluids don’t behave the same in outer space, so a glass would have to have quite a different design, relying on capillary action not gravity to move them from point A to B. Channels guide the fluid from stem to rim. 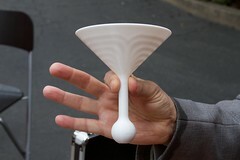 These are 3D printed prototypes of white plastic. Future versions might be 3D printed from clear biocompatible plastic, or made of glass or stainless steel. 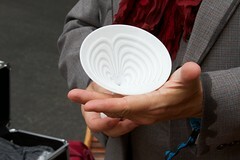 The glass has bulbous bottom with a hollow stem, for balance and fluid delivery. A rubber one-way valve can be inserted into the bottom to allow the glass to be refilled as you drink. They have also made an earthbound variant of this glass that has a more traditional base, allowing it to be set down, when gravity permits. We’re secretly hoping that the next version includes a way to suspend your olive in the middle of the conical section, no toothpick required. 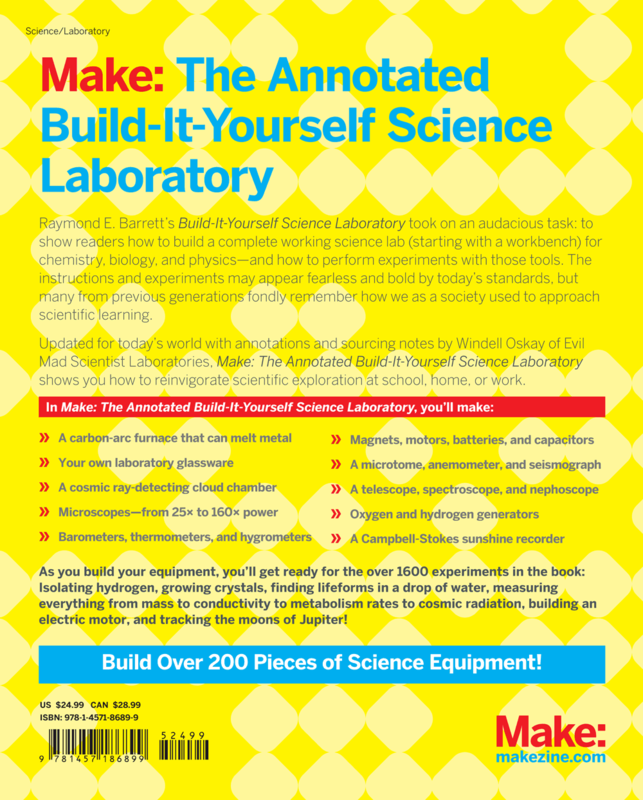 This entry was posted in Engineering, Science and tagged makerfaire, space. Bookmark the Permalink.